We're doing some room reshuffling around here and ended up with a little playroom for the kids. Here's what I did for some super quick wall art: I painted large canvases with the extra seaside blue wall paint from my son's beach-themed bedroom next door. Then I made high-quality 8x10 glossy prints of some close-up shots of the kids. These prints were simply spray-glued to the canvas centers and the art was displayed in a row. Jeanne, what a fabulous site you have. I am excited to offer one of your prints for the auction. Please email me a photo of the one you would like to donate. Your items are beautiful. I really like these blue frames with the white mattes. Simply perfect. I love the versatility of canvas! Your photos look wonderful on these. You have a great site - am enjoying all of your ideas! 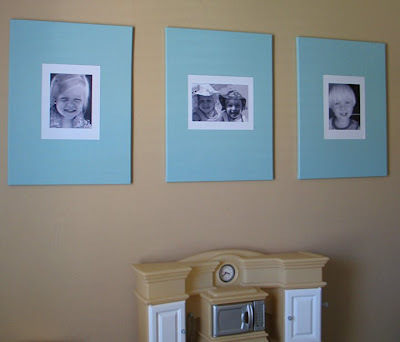 Whoa, I'm totally digging the canvas idea...my walls have been bare since we moved in over 18 months ago...I do have some new pics that need to go up...thanks for your creative genius. Jenni - I centered my photos on the page before printing ... so the white border is just the paper. In Photoshop, select "Print With Preview" and size and position your image. The playroom is where a child’s imagination grows. And the Child Desks where it prospers. Well, I believe in having utility-based Kids Playroom Furniture at home. How big were the canvases? I have been looking for some inexpensive wall art for our family room. THANKS! How big are the canvases? We have been looking for some inexpensive wall art for our family room. THANKS!! Good question Wendie! My canvases are 16x20.